For many cruisers, 45 feet is just about the perfect size for a couple’s cruising boat and the new Balance 451 fits right into that sweet spot. In a boat of this size, nothing onboard is too heavy or large for a normal adult to handle, whether it be the main anchor or the genoa, or the weight of the mainsail as you hoist it. Plus, for East Coast sailors, at 45 feet, you can keep the mast shorter than 63 feet, which is the controlling height of bridges along the Intracoastal Waterway. The Balance 451 is a Roger Hill design that has been enlarged and updated by multihull impresario Phil Berman. The boat has been length – ened with new finely shaped bows and longer stern platforms. This in – creases her nominal hull speed and dampens pitching in head seas. The hulls are narrow at the waterline so the boat will be easily driven and fast in all conditions. Daggerboards have been added that greatly im – prove upwind sailing performance, but the hulls also have small keels to absorb a grounding and to protect the propellers and rudders. Performance is key to the Balance concept. This is not a boat designed for the charter fleets. It is a spirited, light cruiser. The new rig has been given a lot of attention by Berman and sailmaker Bob Pattison at Neil Pryde. The mast had to be kept under 63 feet, so to get the designed large sail area they have lengthened the boom and created a maximum-roach mainsail with full battens. They didn’t go with a square top design because the sails are hard to furl and the top battens are fussy. The max roach compromise is the best solution for a cruising couple that sails without a crew. Weight is the enemy of sailing performance, so Phil and the builders decided to foam core just about everything on the boat from the rigid Bimini, to the bulkheads and floors, to the hatch covers, tables and even the drawers. This is how racing boats are built and has enabled the Balance team to keep the 451’s displacement to a minimum. The 451 is a boat for a couple or a family who will be cruising far and wide and want the comforts of home. It has a large double cabin forward in each hull with queensized berths and plenty of locker and drawer space. 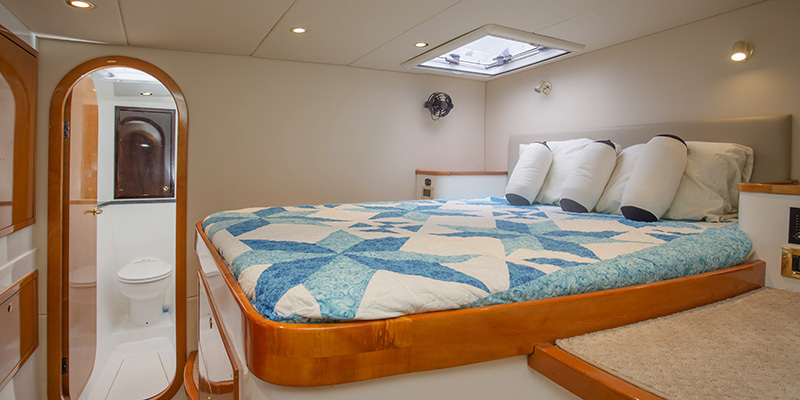 The starboard hull has the master suite with the berth forward and the large head aft. The head has a large, glassenclosed shower. Amidships, the master suite has a desk and lockers. The port hull has a third cabin aft with an athwartships double berth. You access this cabin through the port aft head. There is a small head all the way forward that is en suite with the port forward cabin. The saloon has the large galley to starboard with all of the amenities of home. The inboard end of the counter is rounded and will be a great place to serve meals that are being eaten in the cockpit. The chart table is a proper navigator’s station with room for folded charts and all of the electronics and radios that most modern cruisers carry. A flat screen TV can be mounted on the bulkhead above the chart table. The dinette has a large curved sofa with an artistically shaped table that will seat four. This is the place most cruisers will spend time lounging at night when not in the cockpit and where you will watch movies or read or work on your computer. The space is open, the views through the huge windows are excellent and the sofa dinette has been optimized for ergonomic comforts. In warm weather or southern climates, the crew will spend a lot of time in the cockpit under the protection of the full width Bimini. On the port side, there is a large outside dinette with a drop-leaf table. This is the party zone on the boat and will be perfect for sundowners with a host of friends or those special outside dinners under the stars. The helm is to starboard under the Bimimi and has excellent sight lines looking forward. Skylights allow you to see the mainsail from the helm. This article was originally published in Multihulls Quarterly Magazine is being used with express permission from the publisher.